This site is sponsored and maintained by Rocky Mountain Sunscreen located near Denver, Colorado. 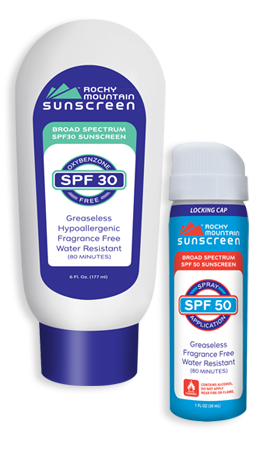 For over 25 years, Rocky Mountain Sunscreen has produced sunscreen products that have been thoroughly tested by independent laboratories for safety and effectiveness. Our formulas were originally created to meet the needs of outdoor enthusiasts (skiers and hikers) in Colorado who were consistently getting sunburned in spite of wearing sunscreen. That’s why we say our products are “Inspired by Altitude”. Built on customer satisfaction and loyalty, Rocky Mountain Sunscreen has grown into a national sunscreen products company and advocate for sun safety. We are famous for our money-saving bulk sunscreens and have been a trusted supplier to schools and camps for over twenty years. Our products meet or exceed all 2012 FDA guidelines for sunscreens. In recent years, some common ingredients in sunscreens have come under fire by environmental activists and special interest groups. Although some may question the “objectivity” of a sunscreen company sponsoring a site on sunscreen safety, we feel a moral obligation to give consumers FACTS and sensible advice they can use to determine for themselves what constitutes a safe sunscreen. Should you find any information on this site you feel is biased or inaccurate, please contact us and we will promptly address your concern. Thank you for visiting Sunscreensafety.info, and we hope you will find the information on this site valuable and educational.